I tried watching this film about 400 times before I ever finished it. For the life of me I can't understand what's so special about it or why people find it entertaining. I get why 60 years ago this would have been relevant, but not today. I'm suspect of anyone who lists this as a great film. The childhood whimsy in the first half of the film is set against a dreary and at times melancholy realist depiction of Paris. Then suddenly, our final glimpse of Paris, as Doinel leaves the city and his innocence behind, is accompanied by a swooning score and the first truly romantic shot of the city. The final act of the film then opens up into beautiful expansive shots of the countryside, culminating in a breathtaking tracking shot at the very end. Masterful filmmaking. 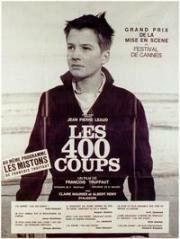 Antoine Doinel: "Oh, I lie now and then, I suppose. Sometimes I'd tell them the truth and they still wouldn't believe me, so I prefer to lie."